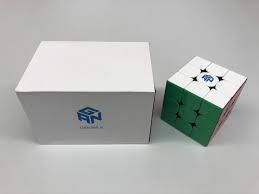 The GAN356 R is a new budget friendly STICKERLESS speedcube from GAN. Polished Stickerless finish to reduce scratches and abrasion. Good cube and very good price. No complaints but I prefer my Moyu GTS 2 and Valk 3 (which had a higher price). Great cube for its price, the speed is great and it is a bit too flexible for my taste but easy to manage. It’s super good! Turns super fast can’t put it down!